KIT BAÑO TRAD. 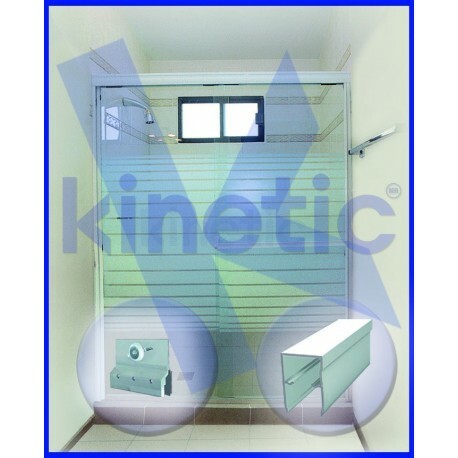 2.03X1.875M BCO CARR.SENCILLA - Kinetic, s.a. de c.v. KIT PARA PUERTA DE BAÑO 2.03X1.875MTS CON CARRETILLA SENCILLA PARA HOJAS DE CRISTAL TEMPLADO MONOLITICO DE 5 A 6MM DE ESPESOR,ACABADO PINTURA BLANCO LISTA DE PARTES: A)RIEL SUPERIOR 1PZA. B)RIEL INFERIOR (REPIS_N)1PZA C)JAMBAS LATERALES 2PZAS. D)TOPES 4PZAS. E)PERFIL TOALLERO 1PZA. F)GUIAS INFERIORES 4PZAS. G)CARRETILLA SENCILLA (SOPORTE PARA EL CRISTAL 4PZAS. H)JALADERAS INTERIORES 2PZAS. I)JALADERAS TOALLERO 2PZAS. J)TAQUETES, PIJAS, EMPAQUES INCLUYE UN INSTRUCTIVO DE INSTALACION EL TOALLERO QUE VA EN EL CANCEL DE 2.03M , TIENE UNA MEDIDA DE 1000MM ,RECOMENDADA PARA UN CRISTAL DE ANCHO MÃ§XIMO 870MM.